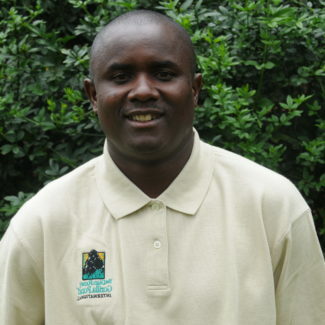 Ildephonse joined the Fossey Fund in May of 2002, and he is the Ecosystem Health & Education Program Manager. He holds a Master of Arts and Social Sciences in Development Studies from Kabale University in Uganda. Currently, Illdephonse is working on a water supply in the villages neighboring the Volcanoes National Park and giving infrastructure support to a local clinic that serves people near the park. His goal is to address human needs in local communities that directly link to the conservation of gorillas and their habitat.